After an early spring with lots of eggs a few weeks ago I started finding fewer and fewer eggs in the nesting boxes. While I found a couple of nests outside the coop with eggs, egg production was still drastically reduced. I wondered whether a hen had gone broody but was never able to find a nest with a broody hen. I got home tonight and ran out to the chicken coop in between rain bursts to collect eggs. While in the chicken coop I heard the very distinctive chirp of young chicks. A quick scan of the area revealed two chicks huddled outside the chicken coop. I dashed around the coop and found the two live chicks and a third one, dead, but no signs of broken shells or of a broody hen. I picked up both chicks and carried them to the brooder side of the chicken coop. After settling them in the brooder I hooked up the lights to keep them warm and cleaned and filled a waterer. However, what to feed them was an issue. The feed store was closed and I don’t keep chick feed on hand unless I have chicks. I finally decided I’d make some instant maple syrup oatmeal and a hardboiled egg to tide them over until I could get to the feed store in the morning. 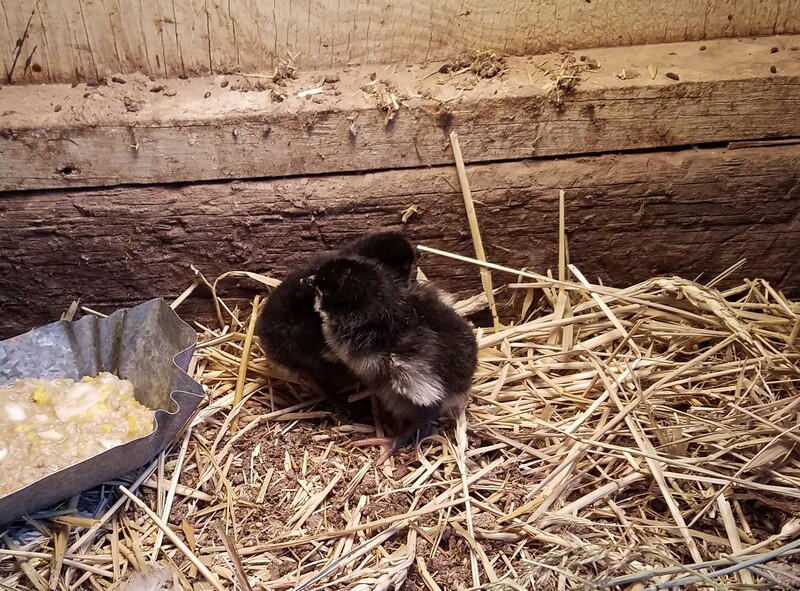 When I took the mix out to the coop and filled a chick feeder for them, I scouted around the chicken coop one more time to look for any other chicks or signs of a nest. I found neither, but I did find a hen hunkered down making distress calls. 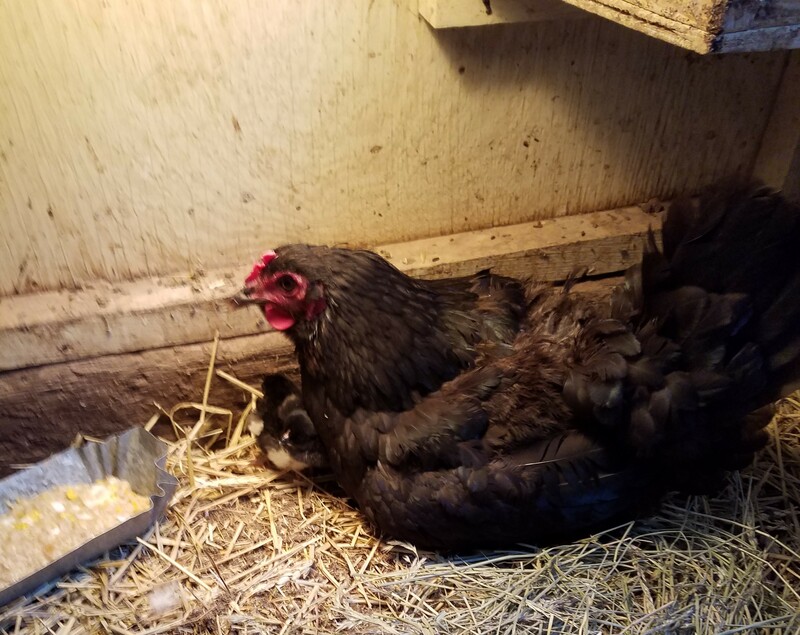 Hoping she was the broody hen, I caught her (at which time her vocalizations turned into seriously pissed off chicken sounds) and carried her around to the brooder. She did settle down over the chicks so I turned off the lights and left all three in peace. This entry was tagged Chickens, Eggs. Bookmark the permalink. Aww and aren’t they cuties! What a life you live! so…how did it go? Was that the broody hen? so sweet, I love babies!!! thanks for sharing Jan. Does she have a license to draw blood? Chicks are so cute. wear gloves, long sleeves and a mask.